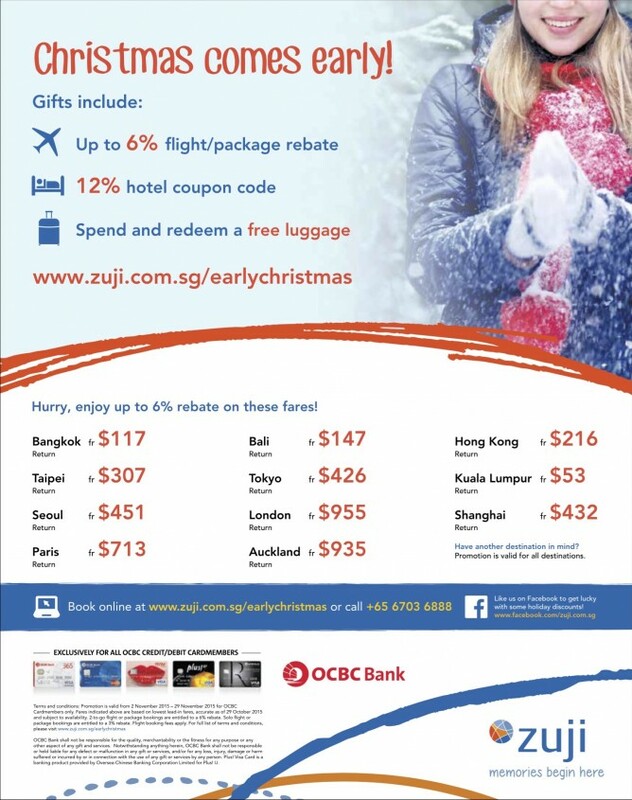 Christmas comes early on Zuji for OCBC Cardmembers! 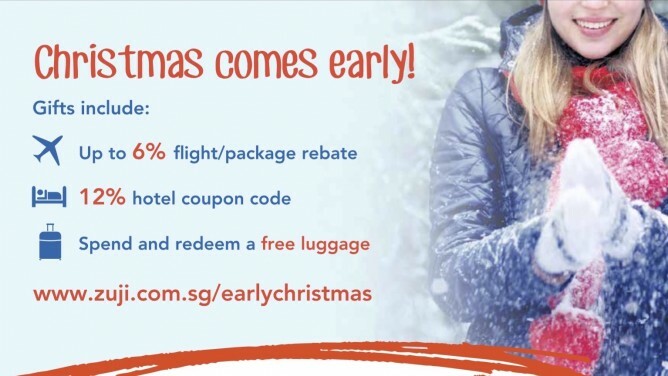 Get your early Christmas gifts when you book your flight, travel package or hotel with Zuji! Enjoy up to 6% rebate on your flight or package booking or 12% off your hotel booking. Promo ends on 29 November 2015. Get a free 20" luggage bag with min. spend of $2400 on your Zuji booking! Terms & Conditions apply. Submit your booking details and receive your rebate within 30 days from the date of submission. 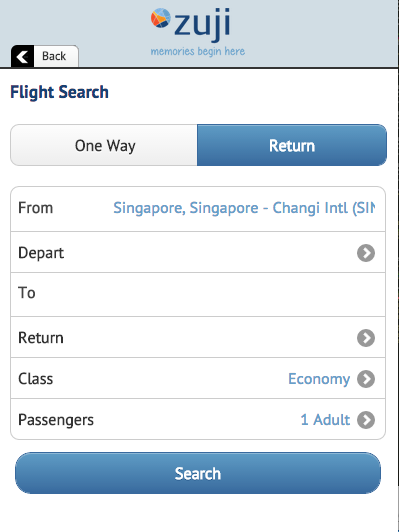 Step 1: Search for flights with your criteria at www.zuji.com.sg. Step 2: Select your preferred flight or package. Step 3: Complete the booking with an OCBC credit or debit card. Step 4: Fill up and submit the rebate claim form. Save up to 6% on your flight and package booking now! Enter Click to show coupon at the hotel payment page and click on 'Apply Code' to enjoy the discount. 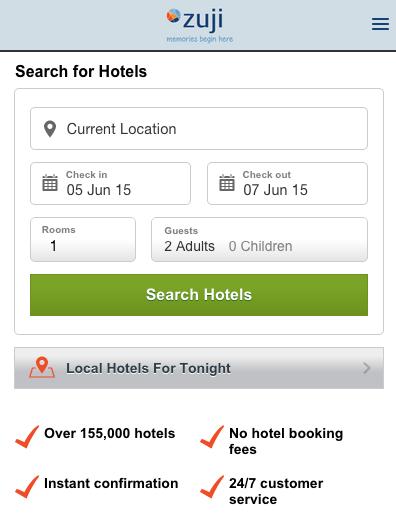 Step 1: Search for hotels with your criteria at hotels.zuji.com.sg. Step 3: Enter Click to show coupon at the payment page (under 'Payment Options'). ##Promotion is valid exclusively for OCBC Cardmembers only. ZUJI reserves the right to charge non-qualified cards with the discounted amount. Complete the form here to redeem your 20" luggage. Minimum spend must be met within a single booking. Limited to the first 50 qualified bookings only. Terms & Conditions apply for the above promotions. See more here. Check out other flight / travel promotions here!